Finally. A weight loss system that makes sense in today’s world. Life in the new millennium is so hectic and harried, it's tough to always eat proper, healthy, home-cooked meals or find time to get all the exercise you would like to do. Envision Medical Spa understands completely. That's why we are offering the Clean Start Weight-Loss System which can help you lose up to 30 pounds in 40 days. Why not freeze it off? Unlike CoolSculpting fat reduction which is also available at Envision Medical Spa, cryolipolysis only targets specific regions of the body, Clean Start is all about reducing overall weight. With this popular program which has already helped more than 60,000 people meet their goal weight; you too can achieve the results you are hoping for. So it's not just another diet? Resetting your body's metabolism to create a new "normal" weight. 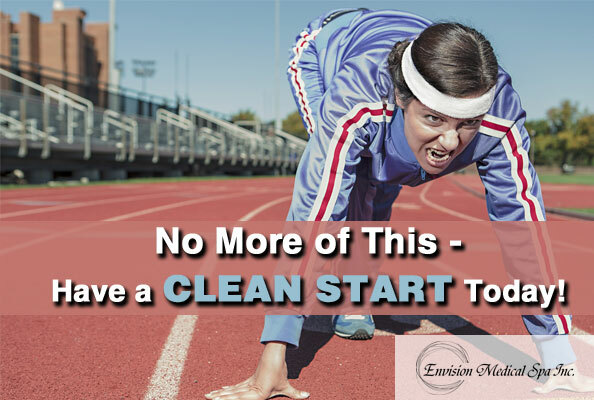 So what's different about Clean Start®? Weekly visits to keep you carefully monitored and constructively motivated. Fat burner and vitamin therapies to melt away stubborn weight and give you more energy. Program Guidebook which explains the system in detail including a handy portion guide, an explanation of the Glycemic Index, information for understanding nutrition labels on food packaging and strategies to avoid emotional eating as well as to reduce cravings. Food Journal to track your daily intake. Clean Start Cook Book provides more than 50 recipes for all three phases of this successful program. One factor that elevates the Clean Start® program above other, less-successful diets you've probably tried already is with the use of special fat-burning and vitamin applications, whichmik can reset your metabolism for lasting weight loss results. This means when you are finished with the program, you will discover your desire for unhealthy foods is diminished and the "full tummy" feeling happens with less food for diminished cravings and long-term success.